Steampunk is a schizophrenic old codger who doesn't know his own name half the time, let alone what century he's in. I say this with love. It's a genre that goes back, way back, yet at the same time it's recent popularity barely resembles the crazy alternate history that gave birth to Steampunk. We're inundated with steampunkers wandering around wearing Victorian clothing, cracking wise about Empires and Britain and speaking in some of the worst faux British accents this side of a Renaissance Festival. Currently, the literature is trying to keep pace with the scene. It's not so much taking inspiration from Steampunk classics like Jeter [Infernal Devices], or Paul Di Filippo's Steampunk Trilogy, but rather going hog wild with the scene that sprung up recently. And even though the scene carries the name of Steampunk, it carries none of the literary background. So instead alt/history books with an almost scientific rigor towards machines that could have been, we've got fantasy novels in Victorian garb. Nothing is wrong with this per se. But I do see a disturbing trend towards Empire worship and a hidden undercurrent of racism. Sure, we've got some people trying to make good with all this (Steampunk Magazine's recent attempt to branch out and sweep this under the rug). And we've heard people quote the SCA, saying they'll take the good stuff out of the time period and ignore the bad. Which seems like a very dangerous thing to me. Especially when it comes to fiction. Novels not only give us a bit of escapism, but are also inspirations and blueprints to our thought process and our moral centers. This is even more dangerous when labelled as escapism--when a novel/short story isn't thought about, isn't argued with (mentally speaking) and is just accepted because it's just fun, we let ourselves make room for all sorts of nasty thoughts in our own mental landscape. Steampunk as escapism that tells us Empire is grand! And has a white washed cast is a very dangerous thing. Especially when you have a group of eager Steampunk scenesters who are younger and trying to fit into this new subculture. There are a lot of books who go against the grain on this such as Boneshaker and China Mieville's Bas Lag books (Perdido Street Station, The Scar, Iron Council). And we need more. We need Steampunk that takes it's cues from literature, not from a movement/scene. We need to see more books with an anti-Empire bent, about anarchists trying to overthrow the evils of Colonialism and the wrongs of a Monarchy. Or even more books taking place in worlds that don't have Empires. There was a large world that existed during that time period, a wide world with a lot of the same access to what has become the founding of Steampunk style technology. Well, the point of my rambling is this: the future of Steampunk looks bright. It doesn't look like it's slowing down as a subculture at all, and a lot of people are starting to read Steampunk books. But there is a danger here, if we don't move away from the Empire/Colonialism and more towards an open Steampunk fashion. And for it to thrive without hate or tyranny, it is a road we need to follow. Paul Jessup does not exist. You can contact him via Ouija board at http://pauljessup.com/. Jessup's linked Steampunk stories the Silas Bay triptych have appeared in Electric Velocipede and PostScripts the first of which The Alchemy of War can be downloaded here. I agree with a lot of what Paul says here. However much I love what would be deemed typical Steampunk (The Affinity Bridge, Anti-Ice, Whitechapel Gods) it is the new school that will have the most impact as they're taking it places it hasn't been before. Tim Aker and Cherie Priest are the best examples of this. But than we have Carriger's comedic series plus a lot of other new books on the horizon that look to move Steampunk beyond Victoriana and the resurgence of Weird West books. I say bring it on! What I like best about Steampunk, is what makes it so difficult to categorize: the sheer genre-bending joy of it. It's not exactly Sci/Fi, it's not quite Fantasy, it's something else. 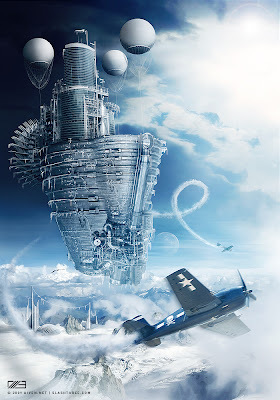 You get Steampunk that screams of the fantastic and weird, like Mieville and S.M.Peters, and you get Steampunk that revels in the real and possible like The Difference Engine, and at the same time there are books that joyously meld the two, like Scott Westerfield's Leviathan. The only way to stay alive, is to grow, and Steampunk is still growing, still finding its place in the world of fiction, and it is still, very much alive. I think this is an excellent article. Escapism isn't bad by itself but steampunk needs to be more than just that. In fact, speculative fiction, which in some ways steampunk is, has the power to address controversial issues in a way that many who would not have been exposed them can be. One other point, steampunks really need to be careful when our escapism begins to romanticize atrocities issues such as imperialism. I Don't think Steampunks romanticize imperialism. One of the key features to the genre/subculture is 'punk'. Rebellion. Steampunk does not ignore the negative side of the period, nor does it embrace it. With Steampunk, and it's sister Cyberpunk, there is a feeling of dystopia, of tyranny and repression, and Steampunk rebels against it. Steampunk is away of saying that all those negative things from the past are still going on now, and we don't like it. "Steampunk is a schizophrenic old codger who doesn't know his own name half the time, let alone what century he's in." That has to be the best one-line summation of steampunk I've seen yet. Being completely new to this whole "steampunk" thing, I was excited about the possibility of new fashions, writing and even films. I am deeply disturbed that there are whispers about racism and agreement with the evils of the past (though we retain most of those evils today). The above writing also grieves me in the sense that I was under the impression "steampunk" is American. What I perceived from it made me think of our love for Jules Verne and H. G. Welles, our admiration for Nikola Tesla and even our fascination with Spring-heeled Jack. I had no idea it was a mere fashion movement with people using awful British accents - is that true? I had enough of that when I saw what they did to our Victorian Goth movement back in the late 1980s. That was a movement that ended up totally classist. Sad. Steampunk should be something great. Hopefully, it will be the next great thing. As old as I am, I look forward to it - and hope the criticisms will not be so dark. I could not disagree more with this guy!It sounds more like unresolved conflicts in your own mind Sr. When was the last time you went to the movies just for the fun it? To me,Steampunk is essentially a multidisciplinary artistic movement in its infancy.Let it mature for God's sake! Then you can write in it all the old negatives that permeate a human society even today. I agree, & I'm one of the new "Steampunk Scenesters" he'd spoken of. I'm interested in the aesthetic mainly on my fascination with the Victorian art nouvuea, & just science-fiction & fantasy. Steampunk seemed really amazing to me when I first found it, but the fact that people seem to take out the ugly facts about the Victorian era & just talk about airships & what-not rather bored me. I honestly think it's important to have those in there, the racism, sexism, & child labor, but not SUPPORT them! Rather as a good cause for an uprising among the steampunk-world's populous! To put it another way, I LOVE Dystopia stories & you could do SO much with that, so why not more of it? It'd certainly fit the "punk" part. & I'd certainly find it more interesting than a "utopia of grandeur". I do have to say what you have said is quite... well a little on the cynical side... even for me. Though I must attain the basic philsophy of steampunk for me is more of the analog nature. Yes the past is screwed up but our present isn't even better. but nonetheless the stories I write do approach many of the issues that occur but from a different perspective. There is no child labour, but there is another far worse practice that took place around the time. There is slavery of one race of sentient creatures and racism involved around it. I took the fantasy route and went down a path that doesn't throw my characters into a victorian london. But rather a highly paganistic society that has been split apart from countless wars by a monothesical, genocidal, cusading mindset that has enslaved nations and killed off anything that isn't them. My world has been sculpted out of mythology and an old pagan mindset rather then love for "'Ello governa! Top of the morning." My world was sculpted as a mere scientific experiment a sci-fi novel that takes the what if factor to the realm of fantasy. Perhaps what I am writing can't be considered Cannon steampunk... but last time I checked a 2400ft long zeppelin that can call down lighting strikes on its enemies is pretty damn close in my book. I just heard of steampunk last week while watching an animated green lanter episode with my kids. I'm 36 and didn't know what my facination was or what it was called. I remeber as a kid watching dune and there's elements of it there and certainly with Wells. I hope that the urban youth pick this up and I agree its new and the race issue will fade as more people get exposed to it (steampunk) and find ways to express themselves...for my part I'm gonna add a Black perpective cause I believe there's room for it!! This is a very clear-headed analysis. There is a lot of white-washing and fetishizing of some pretty nasty things in a lot of steampunk, and, in general, a lack of critical thinking. I loved the call for anti-empirical steampunk, especially because I am writing a webcomic along those lines called Engine. Whilst it's undoubtedly a laudable aim to want more culturally diverse & anti-colonial/imperial takes on alternate 'Steampunk' futures, there's a danger of throwing out the baby with the bathwater here. It's the complex political backdrop of Imperial Houses & a Balkanised Europe that often inspires a 'What If?' creative trajectory. Such late Victorian Empire settings can be found in works as diverse as Frank Herbert's 'Dune' to Alan Moore's 'League of Extraordinary Gentlemen' and I don't think you could seriously level accusations of 'Fascism' or 'Racism' at the foot of either, despite no attempt to analyze or dissect the social & political structures that form such settings. Similarly, in the cultural car-crash that is the 'need' to recognise the 'cultural diversity' of its audience we're now awash in the UK (particularly from the BBC) with PC box ticking & tokenism exercises (masquerading as 'credible' programming) enacted by the white middle class males who run it. This means a member of every ethnic grouping is shoehorned into every comedy, drama & quiz show, making for characters & settings which test the bounds of credibility & all but destroy the original premise of the writer. The BBC recently 'updated' classic 70s drama series 'Upstairs, Downstairs' set in an Edwardian Stately Home by introducing ethnic characters such as a turban wearing, Sikh butler. No one watched & it was soon cancelled. ITV's 'Downton Abbey' doesn't seem to have a similar need to introduce incongruous characters into unbelievable scenarios that completely undermine the historical credibility of the piece from the get go. Viewing figures are through the roof. I don't think a Marxist deconstruction of the obvious socio-economic inequalities on display would get the thumbs up either, do you? I openly welcome 'steampunk' fiction that's from a 'non-white, non-european' perspective, but I think it should be left to non-white non-europeans to write it, judging by the frankly ridiculous, ill-informed audience haemorrhaging efforts of the BBC.